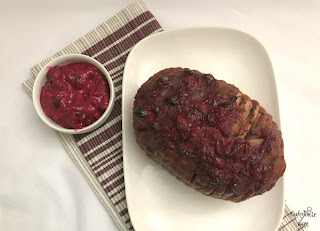 Would you believe that I have tons of ham recipes saved, but I rarely every blog them because it doesn’t make sense to buy a monstrous ham for just the two of us and the photos of a small ham just looks paltry and sad. But this recipe is delicious and I wanted to share it with you. So I bought a 3 pound ham and figured I could just call up some family members to take the leftovers or bring it into work. My guinea pigs there can sometimes become vultures, so it’s not like it wouldn’t get eaten. 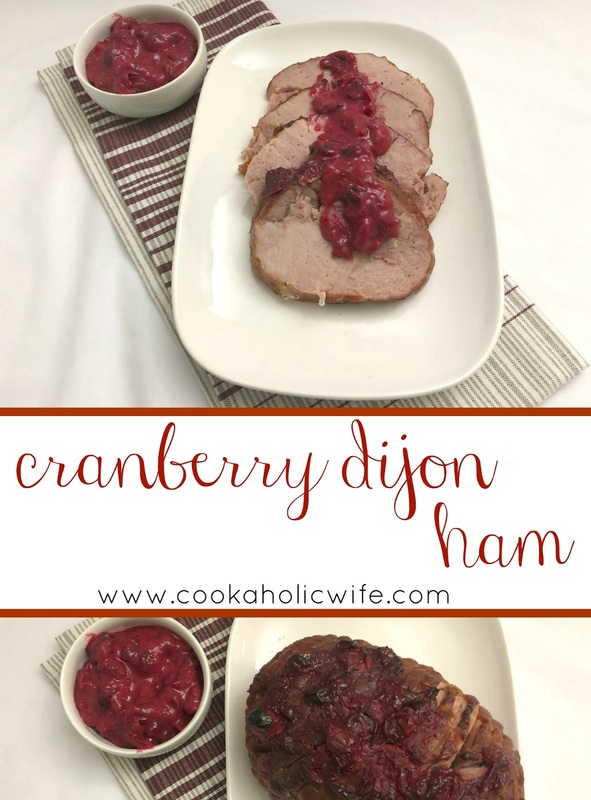 A ham coated in a cranberry dijon sauce perfect for the holidays. 1. Combine the cranberries and water in a medium saucepan over medium heat. Cook for 3-5 minutes or until the cranberries begin to pop. 2. Remove from the heat and stir in the brown sugar, apple cider vinegar and prepared dijon mustard. Taste, adding more sugar or vinegar if needed. 3. Puree with an immersion blender or transfer to a blender to puree until smooth. 4. Preheat the oven to 325 degrees. Place the ham in a roasting pan (or create one using a wire cooling rack and large baking dish) Use a sharp knife to score diagonal lines in the ham (in both directions, creating an ‘x’) and brush with the cranberry mixture. 5. Use a sharp knife to score diagonal lines in the ham (in both directions, creating an ‘x’) and brush with the cranberry mixture. 6. Bake for 1 hour, basting with additional cranberry dijon mixture every 20 minutes, or until the ham is heated through. 7. Slice and arrange the ham on a platter, arranging additional cranberries around the slices. 8. 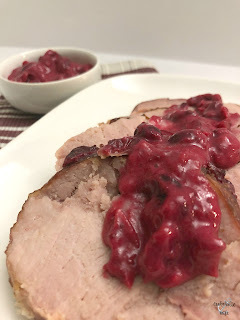 Warm up the remaining cranberry mixture, transfer to a small dish and serve along side the ham. What a nice change for the holidays from turkey! It sounds so easy too!